See our previous articles on Aleppo here, here, here, and here. The Ebla tablets were discovered by an Italian team of excavators at Tell Mardikh in Syria (about 30 miles S of Aleppo) in 1975. More than 17,000 cuneiform tablets were discovered, dating to the mid-third millennium B.C. when Ebla was the capital of a great Canaanite empire. Scholars state that there are important affinities between the Eblaite language and biblical Hebrew, both being members of the Northwest Semitic family. 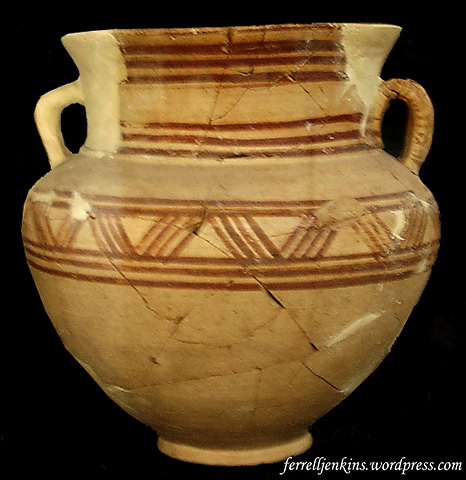 Pottery from Tell Mardikh (Ebla) in Aleppo Museum. Photo by Ferrell Jenkins. It is my understanding that the Aleppo National Museum became the main repository of the Ebla tablets. In a major controversy between the archaeologist (Paolo Matthiae) and the epigrapher (Giovanni Pettinato), the Museum took the side of Professor Matthiae. The controversy between these two scholars played out in scholarly and popular archaeological journals in the late 1970s and the early 1980s. We have posted several articles about Ebla in previous years. You need only put the word Ebla in the Search box to locate those. A large eagle caught our attention. David and I were of the opinion that it belonged to the Roman period, but one of the guards we spoke with insisted that it belonged to the Hellenistic period. 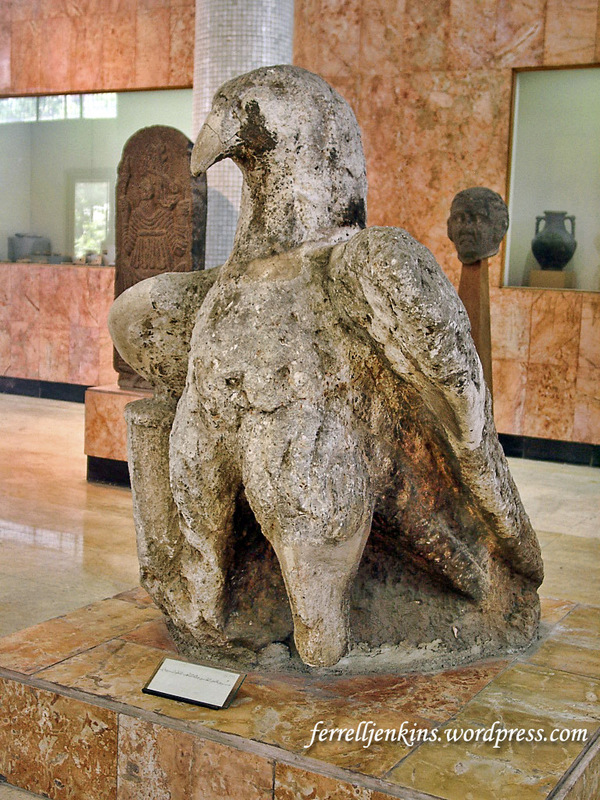 An eagle possibly from the Hellenistic Period in the Aleppo National Museum. Photo by Ferrell Jenkins. 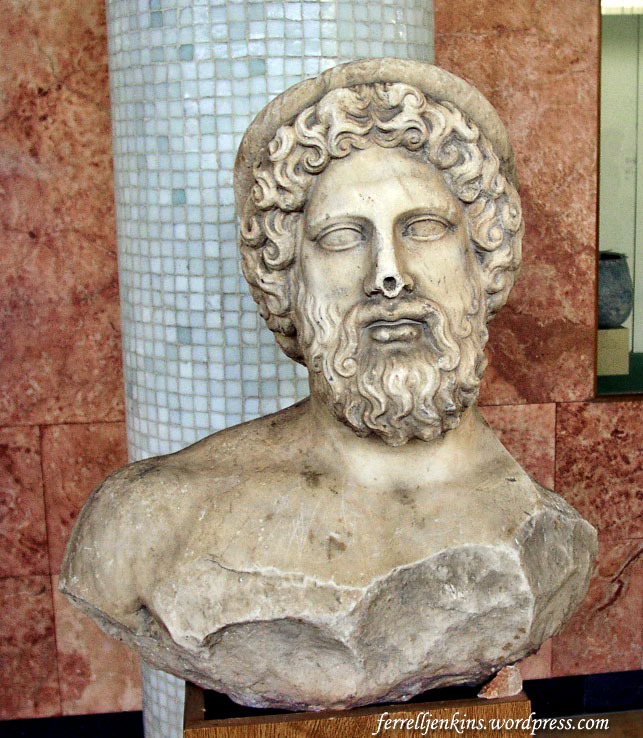 Statues and busts of Asclepios are fairly common throughout the ancient Greek world. Asclepios was known as a god of medicine in the Greek religion. I do not know where this bust was discovered. Bust of the god Asclepios. Photo by Ferrell Jenkins. Even though the quality of the photos leaves much to be desired, I am hopeful that these photos and brief descriptions will be of benefit to those who have not been, and may never get to see the Aleppo National Museum. This concludes the series on Aleppo. This entry was posted in Archaeology, Bible Lands, Bible Places, Greece, Old Testament, Photography, Travel and tagged Aleppo National Museum, Museum, Syria. Bookmark the permalink. The pottery looks like it is either from Cyprus or is a local imitation.